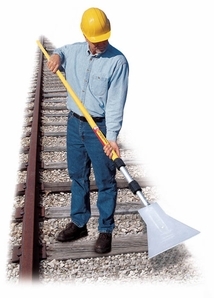 Fiberglass handle extends to 24 feet. Polyethylene paddle has a 10" wide blade. Useful for scraping down bin walls inside covered hopper cars. • Handle: Weight 6 lbs. • Paddle: Weight 2 lbs.